Every year the Edelstam Foundation organizes seminars and events all over the world, in order to promote civic courage and the importance of defending the human rights. Through a co-operation with the Newman Institute in Uppsala the Edelstam Foundation can offer the course: “Civic Courage and Global Service. What is the place of civic courage in the lives of diplomats, aid workers, UN peacekeepers and others engaged in international service? Are these individuals obliged to take great risks in the fulfillment of their duties? How is one to balance a commitment to aiding distant strangers with a wish to protect one’s own family? This course explores these and related questions through biographical studies and films about such figures as Raoul Wallenberg and Harald Edelstam; in-class interviews with diplomats, aid workers and soldiers; and students’ own interview-based research projects. 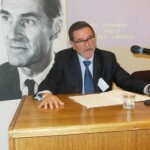 The Foundation currently works to establish an unique university-professorship within civic courage; the Harald Edelstam Chair in Civic Courage. The Committee is chaired by Dr. Hans Ingvar Roth, Professor at the Stockholm University, and other members are Dr. Brian Palmer, former lecturer at Harvard University and today at the University of Uppsala, Ms.Caroline Edelstam, Harald Edelstams granddaughter and Vice-President of the Edelstam Foundation, and Dr. Abelardo Castro Hidalgo, Decanus of the University of Concepcion. We offer tailor-made educational programs, workshops and courses to Governments, organization, institutions, senior high schools and universities world-wide. The Harald Edelstam Archive and Education Institute aims to educate people around the world to take responsibility, ethically and morally, and inspire to acts of civic courage. We work with educating about United Nations Universal Declaration of Human Rights (UNDHR) from 1948 and about practical examples through using historical and contemporary heroes. Human Rights have become morality’s lingua franca. It has become humanity’s common language. Through combining the human rights and exemplifying them with heroes who have played an essential role in relation to each article of the UNDHR, we will make the concept of Democracy and the content of the UNDHR available to people on a common level, through art, literature, and discussion. Action in the field of hostile environments, however, is a privilege of a few, because exceptional courage is required. In extreme situations of widespread human sufferings and persecution, those who are willing to risk themselves on behalf of others, not only save lives, but most importantly preserve for all of us the essential value of human dignity, indispensable for our lives being worth living. Ambassador Harald Edelstam is one of these few exceptions. In every situation in which he was confronted, he had the option of using his diplomatic immunity for saving himself, or the choice of acting to protect others in imminent danger. He decided to act, whatever the price. His generosity left us a legacy of coherence and responsibility, a reference for our collective duty to act in protection of defenceless people who are the victims of serious abuses. Please, contact the Edelstam Foundation for further information. 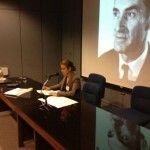 Ms. Caroline Edelstam talking of Civic Courage and Human Rights, University of Concepcion, Chile. 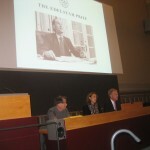 Mr. Henrik Janbell, Ms. Caroline Edelstam, and Ambassador Jan Axel Nordlander lecturing at Uppsala University, Sweden. 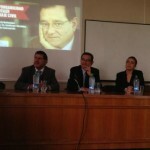 Dr. Abelardo Castro, Dr. Carlos Castresana, and Ms. Caroline Edelstam lecturing at the Faculty of Law, University of Concepcion, Chile. 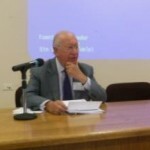 Dr. Carlos Castresana, Board Member of the Edelstam Foundation, lecturing about Responsibility to Protectat, at the National Stadium in Chile. Dr. Ricardo Lagos, former President of Chile and Member of the Edelstam Prize Jury, lecturing about Human Rights and Democracy in relation to Responsibility to Protect, National Stadium of Chile. 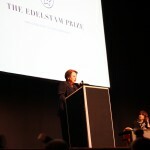 Dr. Shirin Ebadi, Member of the Edelstam Prize Jury, lecturing about civic courage and her experiences from her home country, Iran. The winner of the Edelstam Prize can be a private person or a person who serves in Government, international or national organisations. The winner shall be an individual who has acted in Ambassador Harald Edelstam’s spirit in a country/countries where Human Rights, according to international law, have been violated.